Recently a very exciting development has taken place which confirms our confidence in the usefulness of the TKRN project, and its potential to persist beyond the lifetime of the project itself. 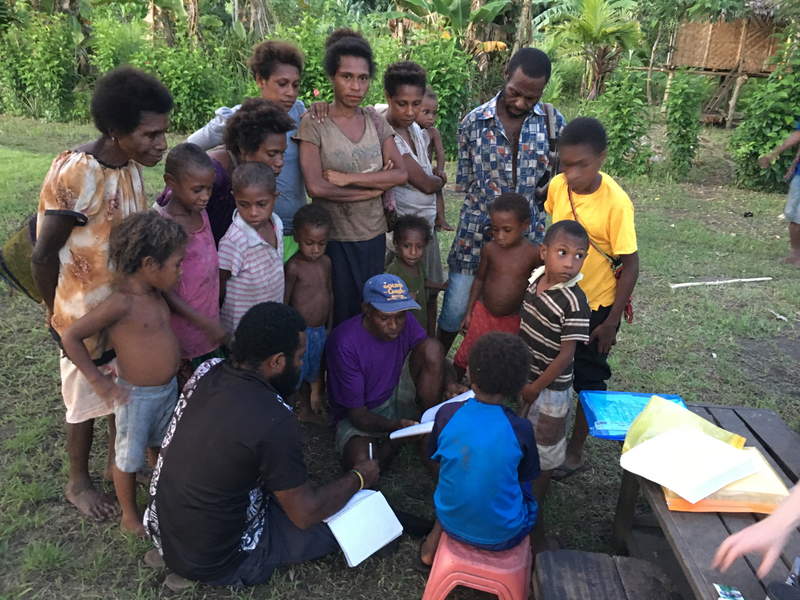 This milestone is the scanning and uploading of over 40 new TKRN notebooks created by people on the Rai Coast to the Reite village online library by Urufaf Anip, one of the Reite villagers, using the TKRN publishing kit we left in Madang for this purpose. At the end of our last visit to Papua New Guinea, I spent two days in intensive media training with Urufaf and his sister, Pasen Anip. Neither has used a computer before, although both very familiar with smartphones. We started from basic introduction to the computer and how to switch it on, to exploring the file system and then to setting up email accounts. From there we progressed to using the web, and creating accounts for them both in WordPress so they could post material on the Reite online library site, and how to scan in completed notebooks as multi-page PDFs, name the files and generate images of the front covers. As we were about to leave PNG, James and I put together a document (in both English & Tok Pisin versions) to remind them of the various steps involved in each process that they could refer to next time – knowing that a one-off intensive training session would never be enough to embed the learning required. Fortunately, the project has been supported by Banak Gamui of the Karawari Cave Arts Project based in Madang, who are hosting the TKRN publishing kit, providing internet access and help with using the technology. Banak’s assistance has been invaluable both in hosting the kit and supporting Reite people such as Urufaf to come into town and help with familiarising them with how to use the computer and the internet to scan in and store online versions of the books they make. It has been a long journey since our first notebook experiment in 2012, but we have now arrived at a point where Reite people are able not only to complete the physical paper notebooks, but have the capability and competency to digitise them and upload them to the internet for long term preservation. 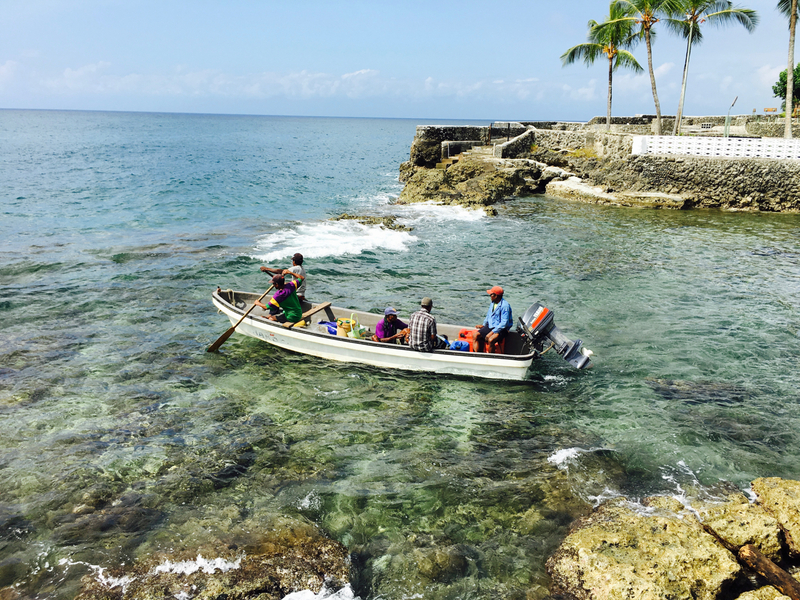 Our trip to the village last month also bore witness to a resurgence in people’s desire to teach and learn their traditional local language, Negkini, as a crucial factor in cultural and social cohesion. There was lots of interest in using the TKRN books to begin writing in Negkini (something only first attempted a few years ago) – both by individuals in the community as well as from teachers at the local school. This suggests so much possibility for cultural renewal and enrichment, especially when combined with the digital skills and capabilities being demonstrated by Urufaf – indigenous public authoring is becoming a practical reality, much more than a vision for what might be possible, or a dream. 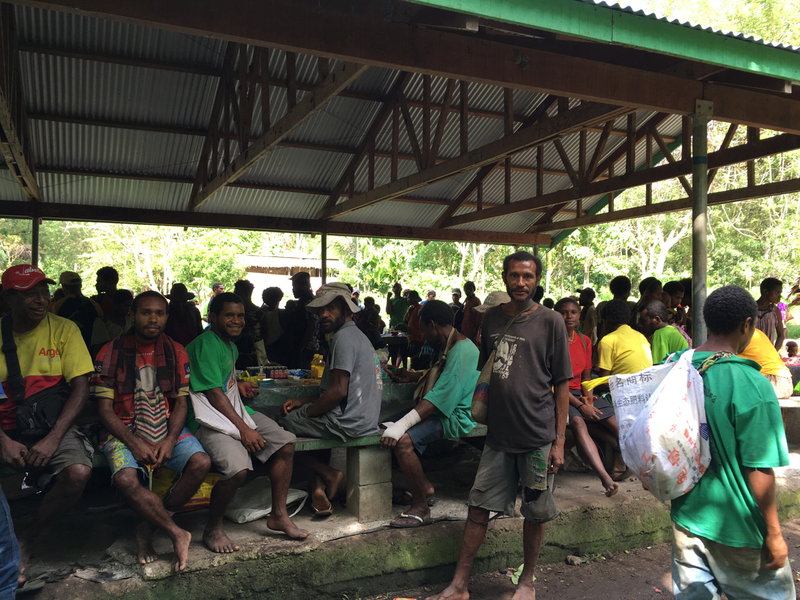 I’ve recently returned from Papua New Guinea where, with James Leach, I have been doing field work for our TK Reite Notebooks (TKRN) project. This follows on from our work last year in Reite village on Madang’s Rai Coast, and also from our trip to Vanuatu in February, where we worked with a group of women fieldworkers and the Vanuatu Cultural Centre. Having established the model of working with the notebooks with Reite villagers last year, the focus of our trip in this second year of the project was not to produce more books, but to explore how and if the model would work with other communities and, to find other local partners for whom the tools and techniques we have developed could be useful additions to their own methods and practices of documenting traditional knowledge. Through our close discussions with Catherine Sparks and Yat Paol of The Christensen Fund (our project’s main sponsor), we identified some possibilities – the Research + Conservation Foundation (RCF) of Papua New Guinea (in Goroka, Eastern Highland Province); and Tokain village, Bogia District (Madang Province). 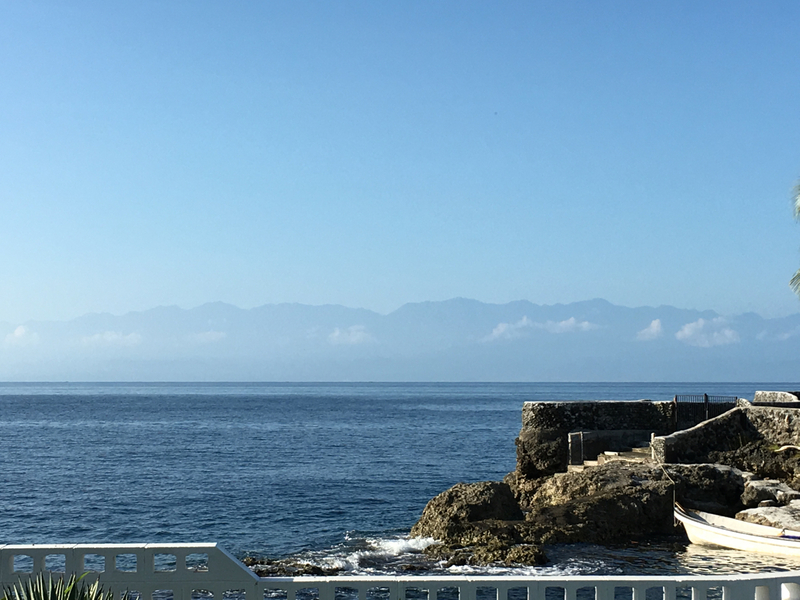 Having arrived in Madang and met up with two of our key collaborators from Reite – Porer Nombo and Pinbin Sisau – we made plans to travel up the coast to the village of Tokain and stay a few days to introduce our model to local people. James and I then travelled to Goroka to spend a day at RCF meeting with their director, Sangion Tiu, education programme manager, Emmie Betabete, and resource officer, Milan Korarome. We learnt about RCF’s work in communities and in teacher training, and presented our TKRN approach. This resonated strongly with RCF whose staff spoke of the problem of documenting traditional knowledge in both school and village settings. It was a lovely moment when their enthusiasm for the books spilled over and we decided on the spot to co-design a new template with them. We then spent a while devising questions about climate change for elementary schoolchildren, which RCF will pilot this summer. 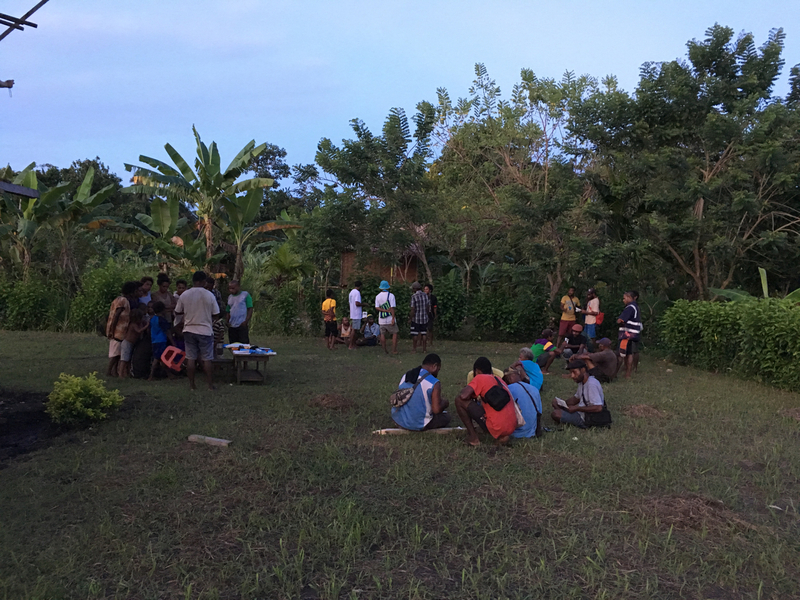 We returned to Madang after this highly successful meeting and the next day set out for Tokain with Porer, Pinbin and another young man from Reite, Urufaf, who has become a key proponent of using the TKRN books in his own community. Piling aboard a PMV (an open back truck with benches and a tarpaulin for sun/rain cover) we bumped along the highway following the coast north for about 4 hours before arriving. Many people from the village turned out to meet us and hear Porer, Pinbin and James introduce what the Reite villagers had done with the TKRN books and why it was important to them to preserve and transmit their culture and knowledge to future generations this way. The following morning we walked around different parts of the village meeting people going to market and in the community office, where they have a laptop and printer/scanner of their own, giving us an opportunity to demonstrate the whole cycle of printing off a PDF booklet, filling it in, scanning and storing it as a PDF on the computer and printing out another copy of the scanned book. Then we addressed all the students from the elementary and primary schools, their teachers and some of the village elders – again, the focus being on the Reite villagers explaining their use of the books and how the school in Reite had adopted the books as part of their own curriculum activities on environmental science and cultural heritage. This indigenous or local exchange of documentation practices (with James and myself taking a secondary role as facilitators rather than teachers) is very much the beginning of where we see the TKRN model developing in the future. The afternoon was spent workshopping ideas for the booklets and getting people used to the cutting and folding process for making up the books, as well as taking their photos to stick onto their books – always a popular aspect of the process. This continued well into the night with the convivial atmosphere of a house party surrounding the guesthouse where we stayed. 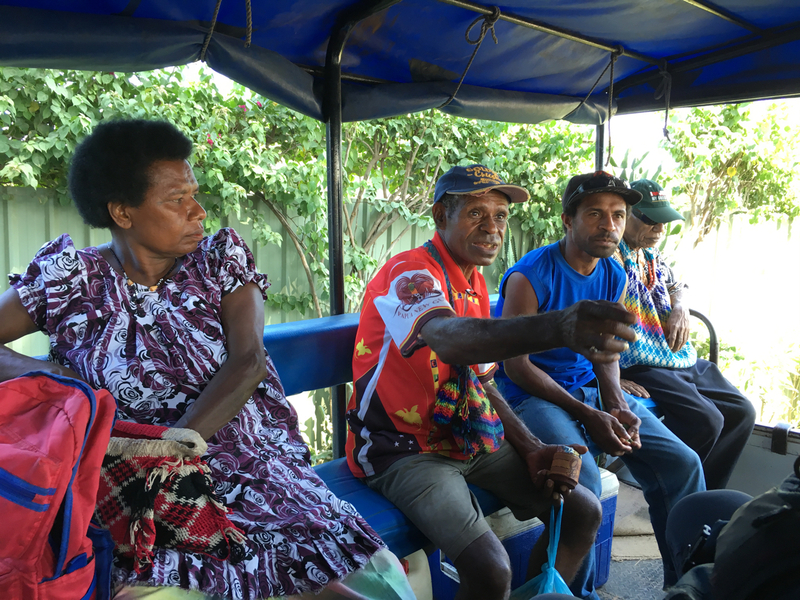 We left Tokain having agreed to meet up in a week or so’s time with a representative from the village who would bring us the first batch of completed books to scan and for me to build a simple website for – as I did last year for Reite (Reite Online Library). 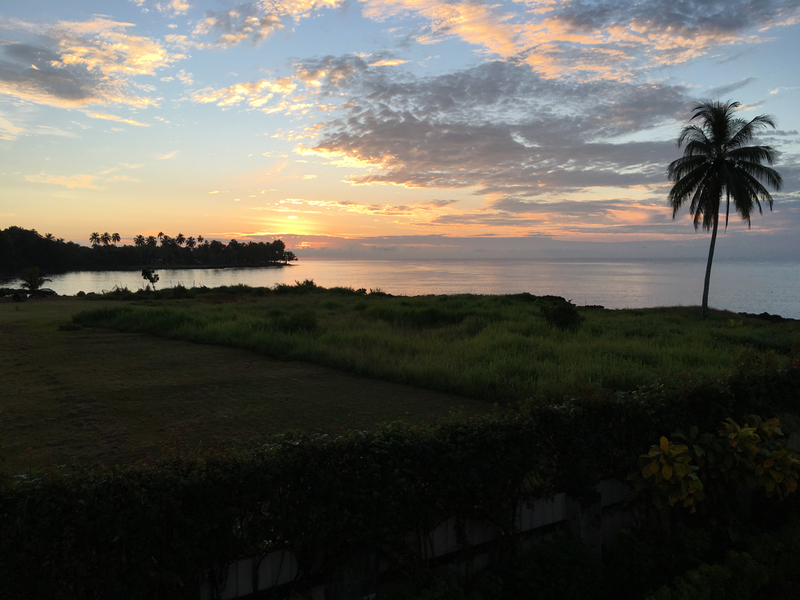 From Madang we set off across Astrolabe Bay and down the Rai Coast to return to Reite for a few days and discuss with the community what had happened since our last field trip and what we proposed to do next. A meeting was organised and many people also came from neighbouring villages and hamlets: Sarangama, Asang, Marpungae and Serieng. Porer, Pinbin and Urufaf all spoke about the project, what was achieved last year, what we had just done at Tokain and how important it is for knowledge to continue to thrive and be passed on to future generations despite all the changes happening to the world around them. James also spoke of our visit to Vanuatu, how we had shared some of the Reite books with the indigenous fieldworkers there and we showed them some of the books made by the ni-Vanuatu people we met. The response was dramatically positive, with people calling for a revival of teaching and learning in their traditional local language, Nekgini, alongside using Tok Pisin to document stories and practices. A core group of people interested in taking the lead to build up a library of traditional knowledge also emerged, a group who were also prepared to go ‘on patrol’ to other local villages to share with them the TKRN methods. We left over 250 blank books in the village, as well as a simple to operate Polaroid Snap camera (and several hundred sheets of Zink photo paper) to take and print out photos of people to stick on the front covers. By shifting the focus from the familiar and everyday towards the more esoteric, and perhaps endangered, types of knowledge of their environment that Reite people have, we are hoping they will be able to develop a truly unique and exemplary library that could inspire others across PNG, Melanesia and perhaps even farther afield to document their traditional knowledge before it is lost. We also took the opportunity to improve the design of the books, redesigning the front covers to allow for more contextual information about the author and the books contents, and rewriting the engaged consent statement on the front for better clarity. Returning again to Madang we met with Ernest Kaket from Tokain and scanned in the books he’d brought with him from the village. These now form the foundation of their own online library which we hope to expand in due course. Our next steps are to make a return visit to Vanuatu with a couple of Reite villagers to introduce their use of the TKRN model themselves; and to continue to develop the basis of a partnership with RCF as a means of extending the reach across PNG of the tools and methods we’ve co-created with Reite people.